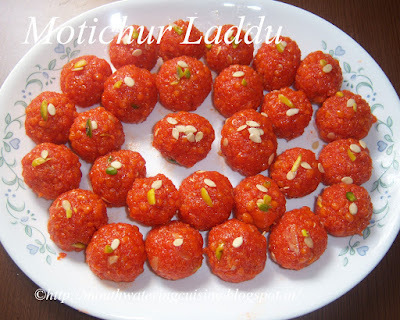 Motichur Laddu is another famous sweet in India. It is made specially during Holi, Diwali and Ganesh Chaturthi festivals. It is made out of besan (Bengal gram flour) batter fried in ghee and simmered in sugar syrup and made laddus. Both boondi (the small beads made by frying) laddu and motichur laddu are made with besan batter only. The only difference between boondi laddu and motichur laddu is that boondi is fried in oil for normal laddu and colour is nt added. For motichur, boondi is fried in ghee. And, for boondi laddu, the beads (boondi) needs to made in a slightly bigger size boondis and for motichur, it needs to be made very small and tiny. For easy guidance watch the video. Blanch almonds and pistachio for about half an hour. Chop them and keep aside. Add water and half of food color to the besan and make batter. The batter should be like that of dosa batter. A special ladle is available in the market for making boondi. It is known as Boondi Jhaara. It has long handle attached to a plate with lot of holes on it. Heat oil in a kadai. hold boondi ladle with one hand over hot oil. Be careful not to burn hands. Slowly pour a cup full or ladle full of batter into it and drop all the boondis into hot oil. Fry them till they are crisp and take them with a slotted ladle onto a plate. In a thick bottomed vessel, add water, sugar and color. Keep it aside for about half an hour. Bring it to boil and let the sugar melt completely. Boil till it reaches one string consistency. Add milk to it and bring it one boil. Add fried boondi and mix well. Let it cook for two to three minutes. Allow this to cool for a while. Add one tbsp water and put this mixture into mixer jar. Press pulse for once, be careful let the boondis should not loose its shape. Take this into a plate and add melon seeds, chopped almonds and pistachios. Mix well and make laddus of our desired size. 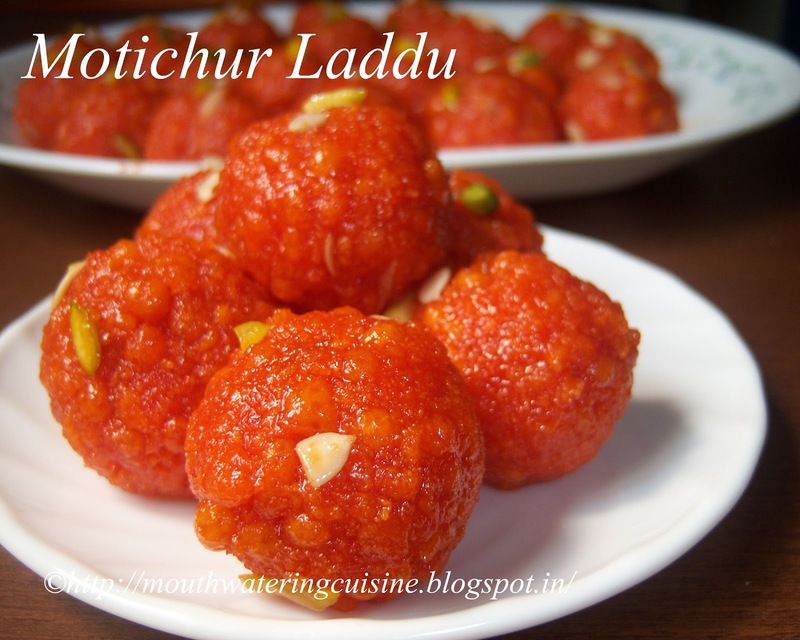 Serve motichur laddu any time. Consume them within two days. For more sweets n snacks recipe click here. Thank you for visiting my blog. Hope you like all the recipes. Any feedback and comments are appreciated.